The last quarter of 2018 was very hectic and busy as we wrapped up our life in California and moved to Iceland. We downsized our belongings significantly, packed them up and moved them into a storage facility in Reykjavik. I had kept a few ongoing projects with me, intending to work on them in between moves. 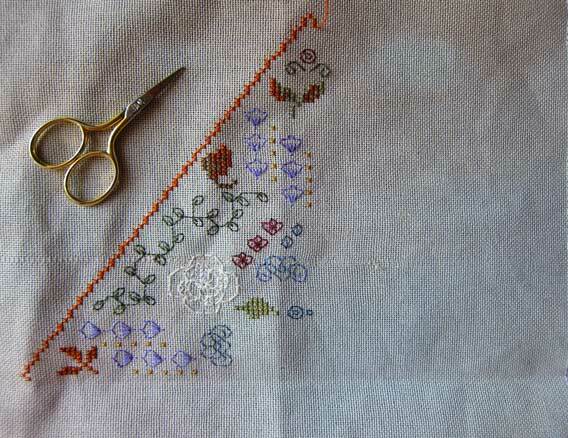 Well, I need not have bothered because I didn’t put a stitch on them. With so much going on, I just didn’t feel relaxed enough to sit and stitch. We got settled into our Reykjavik apartment this month, and all my needlework supplies are back with me now. I was going through my pile of unfinished projects accumulated over the years. While I don’t feel guilty about abandoning them, they still niggled me sometimes – tangible reminders of my tendency to chase new, shiny objects and then tire of them. I revisited each UFO with a goal to either finish it or throw it out once and for all. Surprisingly, I felt like working on some of them again. So I think 2019 is going to be a year of showing some love to old, unfinished projects. Here is the first one. It was mystery SAL in Sticklounge, a now-defunct yahoo group. 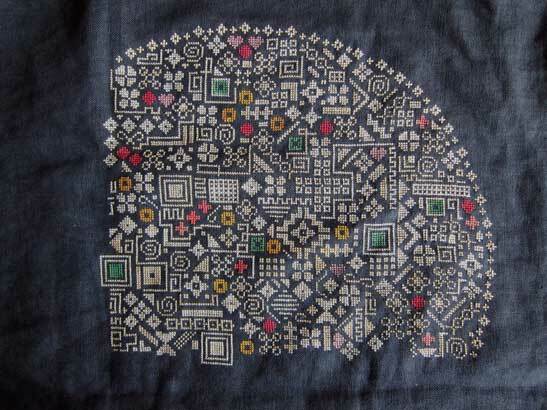 It had nine parts, a mix of cross-stitch and blackwork. I ended up not liking the modernistic blackwork parts and gave up after part 8. Fortunately, I still had the last part saved in my email archives. Ten years later, I find that I really like this piece! 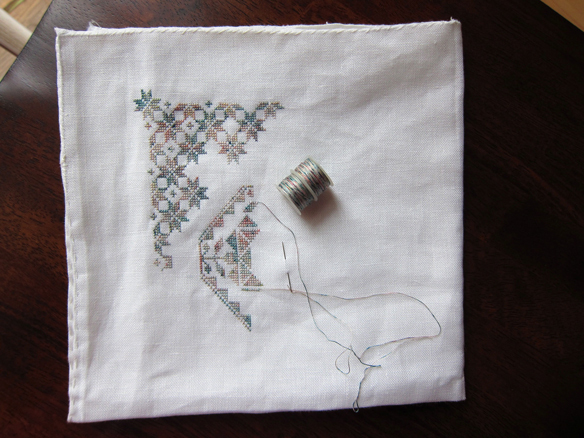 Here is my progress on the project that I am stitching in the Marquoir group (pattern is by Jean Louis Grandsire). I have completed 9 parts. The pattern is being released in 36 parts. I am using Examplar White Chocolate and a mystery dark color. Do you notice the difference in shades of the dark floss? I kitted this when I was an HDF newbie and had no idea that the dates on skeins represented dye-lots. I had 5-6 skeins of this color in dbags and I could have sworn they were all the same shade – I looked at them several times in daylight. It does not bother me yet, but I am a bit worried how the final piece may look awkward. Should I frog? Eventually I decided to keep calm and stitch on without ripping the offending parts. The piece turned out just fine. It’s been almost five years now and I still agonize about color choices but I have stopped wringing my hands over minor changes in shades and dye lots; in fact, I welcome them as they break the monotony of a color and add interest to the piece. Here is finished work. 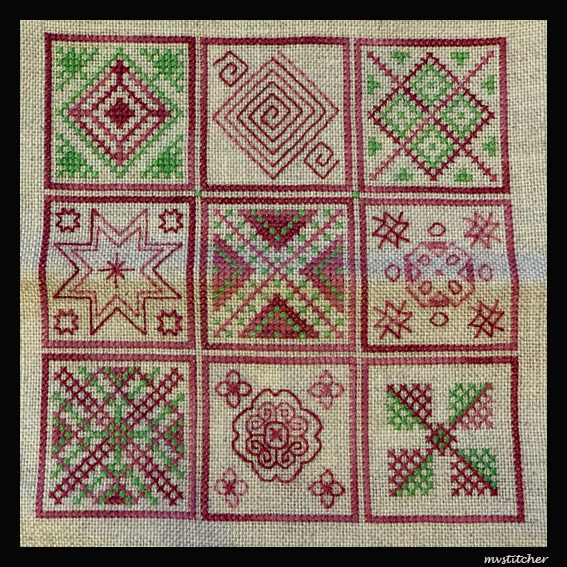 This is one of the two new projects that I started this year, after completing the Christmas Sampler. It is being stitched in the German yahoo group to which I belong – Sticklounge. Each part will be released at biweekly intervals. With 24 parts, it’s going to be a year-long project. 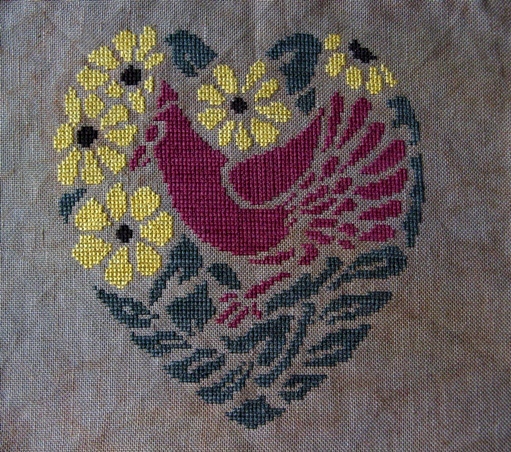 This is a new pattern I am stitching in the Sticklounge yahoo group. 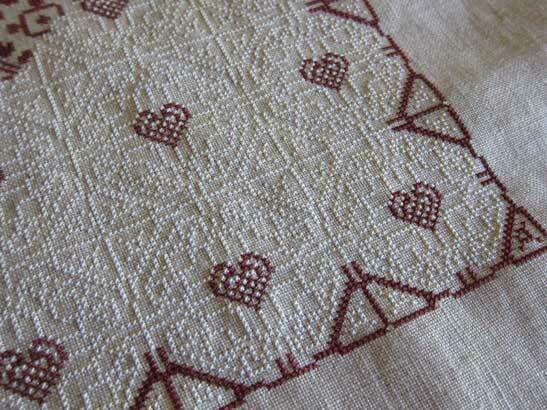 I am not very fond of blackwork, but I needed to be in a current project to keep my membership in the group active. I do like how it is shaping up even though I changed the colors from the original and not all the colors can be called “autumnal”. Once stitched, it is supposed to be sewed into a bag, but with my non-existent sewing skills, this will remain only a piece of stitched fabric. 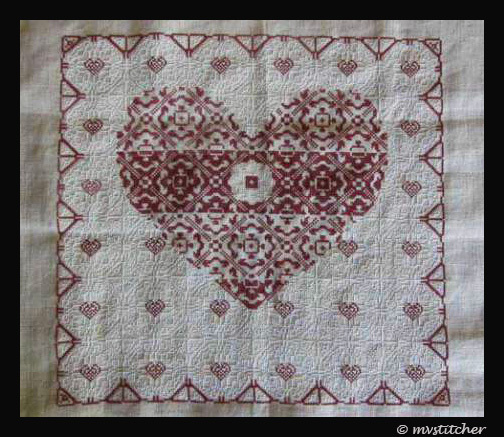 This is another pattern I was stitching in the German yahoo group, Sticklounge. However, I could not keep up with the deadlines and this is currently at part 7, with 6 more parts remaining to completion. 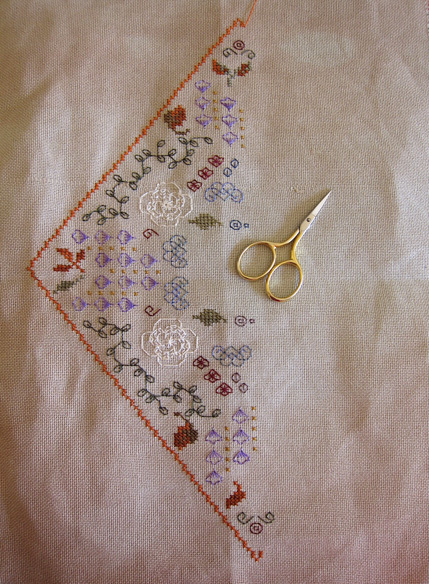 I plan to restart it as soon as I finish the Christmas Sampler. 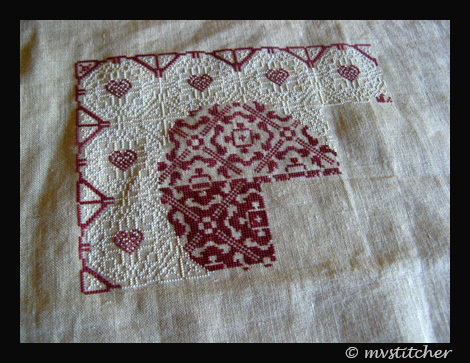 This was the first piece I ever stitched with Hand-Dyed Fibers (HDF), and the beginning of my silk addiction. It was also the first piece I finished when I resumed cross-stitching after a hiatus of 10 years. 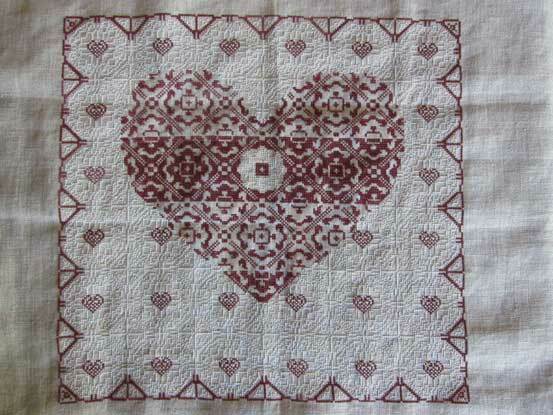 This pattern was stitched with the designer’s permission in the Sticklounge yahoo group (it was known as the Marquoir group when I joined and stitched this design).